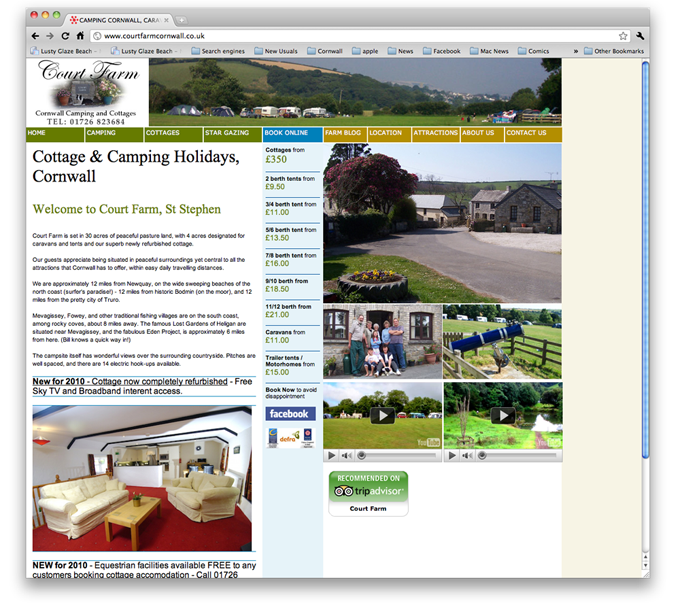 Court Farm offer Holiday Cottages, Camping and Caravanning Accommodation in Mid Cornwall. In 2008, they updated their website with a fresher look that also allowed user to see prices for various kinds of accommodation on offer. They have continued to expand their web presence by adding video, a blog and now are actively using Facebook to promote their services. Fundamental to the site’s success has been the client’s commitment to targeted PPC Google and Yahoo Adword campaigns. Court Farm offer Holiday Cottages, Camping and Caravanning Accommodation in Mid Cornwall.In 2008, they updated their website with a fresher look that also allowed user to see prices for various kinds of accommodation on offer.They have continued to expand their web presence by adding video, a blog and now are actively using Facebook to promote their services.Fundamental to the site’s success has been the client’s commitment to targeted PPC Google and Yahoo Adword campaigns.